It really is all about the Journey and almost nothing to do with the success or lack of success, whatever your personal definition is of success. According to Dr. Curtis Hutson, success is knowing God’s will for you and doing it. We just finished our second Mountain Top Safari. We had 4 combat-wounded, active duty service men and veterans in for a 5 day elk hunt with a day prior to acclimatize. Suffice it to say, the elk did not cooperate. But, the hunt was great. We were elk hunting up north of Red River, NM. We camped at just above the 10,000 foot elevation mark. The weather was pretty strong for mid – October. We had snow on Friday before going to camp on Saturday. Then we had a sleet storm on Sunday night. And by sleet storm, I mean thunder and lightning, rain, and then sleet. And on Monday night I do not know how cold it got, but my nephew’s radiator froze and it was supposedly good to 5 degrees above zero. Let me just say, it was dad gum cold. We left camp on Tuesday, no great foresight or planning on any of our part, just the Good Lord taking care of us. And that night we had 4-6 inches of snow down at the house. It appeared to snow all day on Wednesday up where we camped. The weather was challenging. The elk did not cooperate. A grand time was had by all. 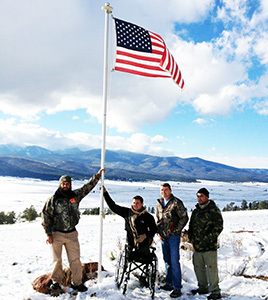 Participating in this year’s hunt were 4 combat-wounded service men. These are fine men, proud and strong. The names have been left out to protect their identity and because of the high degree of respect I have for them. One young man is a young marine wounded in combat. He had both legs amputated very high as a result of an IED blast. He was quite an inspiration to us as well as to everyone he encountered. Despite his physical struggles, he is moving on with his life. It was always encouraging to watch as he hopped out of his chair and into the back seat of a pickup. Once they reached the area to hunt, he hopped on the back of one of the hosts and into the back of the pickup. I did not witness the first day’s hunt, but later in the week watched him ride in the back of my pickup as we hunted for an elk. It was fairly chilly and fairly rough country, particularly to be riding in the back of a pickup with no legs to brace you or absorb the shock. I saw nothing but a smile on his face the whole ride. Of course, some of that could have been that the best looking lumberjack in North America was helping with the guide duties…..
Another is a young soldier wounded by an RPG blast to the vehicle where he was riding as gunner. He lost one leg at the knee. You should see him flip that prosthetic around and use it as a shooting rest or just a conversation piece. The first day of the hunt we took off on a 2 mile walk to hunt for an elk. Of course, short is relative, and even slightly uphill above 10,000 foot elevation with any sort of uphill climb and a temperature of less than 20 degrees makes it difficult. He never really stopped, just kept climbing and hunting. I think the challenge of climbing up, packing his rifle and hunting gear, and just keeping moving put a smile on his face and in his heart. I know it did mine. Another of our hunters is a helicopter pilot wounded when the Blackhawk he was flying was shot down by an RPG. He has served in a couple of branches of the military over many years. One of the other guys took him out on another hike to hunt for an elk on the first morning. Again, short hike and uphill are not the same in the mountains of northern New Mexico compared to south Texas or Georgia. Even though he was in a lot of pain and discomfort, he always put the needs of the group ahead of his own. If you think soldiers do not serve out of a true servant’s heart, you should be there to watch and listen to these guys. Our last hunter is a young man wounded by an IED while in a humvee. He was severely injured by the blast and has limited use of one leg from the explosion. He is full of life. He went with me as we hiked and hunted for elk that first morning. Now if you know me, you know I am not long and lean, and at one point he looked at me and says, “What are you, a Kenyan? You are running circles around us.” Those of you who know me may now laugh appropriately as I do not know anyone who would describe me as being of the type of physical condition as a Kenyan. This young man appears to be physically healthy. He has his own set of physical limitations. Besides being the camp clown, he has one of the biggest servant’s hearts I have ever witnessed. If you think men who serve in these front line military units are warriors, you are right. If you do not realize they are servants, you are dead wrong. We had several men and women who served in logistical support for the hunt and I would be remiss in not giving them a note. Greg Cliadikis provided transportation from Albuquerque to the area and then drove up and carried the guys back to the Albuquerque airport. I personally had no idea how important this would be at the end of the hunt, but we were all pretty darn worn out and his servant’s heart really made a big difference for everyone. Rachel, the best looking lumberjack in North America, was committed to supporting this hunt since her involvement in last year’s hunt. She secured donations of food and other supplies as well helping with making camp and with guiding. Technically, we do not guide, we host. Rachel was and will be a foundation of support for these hunts. She said to me after it was over and everyone was gone, “I know we do this to minister to these folks, but I think I am ministered to more than they are.” I would say she summed it up for all of us. Joe was another who provided a lot of support for this hunt. Joe and I came into contact when I responded to an ad he ran for elk permits. When I told Joe what the permits were for, he quickly said, let me call you back. I got a call back a few hours later and he told me to call the land owner directly. Joe is a broker of tags and makes a part of his living by reselling tags. He simply cut himself out of the deal. So while a lot of us put time and resources into this hunt, Joe truly put himself into it. He also had his company provide jackets for the hunters and t-shirts for everyone. And I think Joe helped host hunters almost every day and twice a day most days. Cole and Brendon, what can I say. You cannot put together something like this and have any expectation of success without some young legs and young hearts. Both of these guys were more of the generation of the majority of our hunters, which is a generation younger than the rest of us. They went without sleep, some of that self-imposed, worked longer, got up early and stayed up late. They helped set up camp, cook, clean, tear down and rarely sat down. Usually one of them saw something that needed doing and had it done before the rest of us recognized it needed doing. And if they were ever given a task, you did not have to check and see if it was accomplished. It was, and better than the rest of us would have done it. One word of advice, never, ever attempt a hunt like this without a pair like these two. We would not be able to provide these hunts without the assistance of Cone Underwood and John Branum. Both of these men are retired military and have ongoing contacts with wounded warriors in transition in their respective areas. They provide escorts for the hunters to New Mexico as well as helping out with camp cooking duties and general support all during the hunt. Their experience in the military and relationships with the military are invaluable as is their presence on the hunt. We truly would not be able to put these hunts on without them. 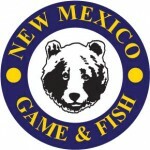 Alan Chapman – Alan dreamed this deal up with me as we were on the side of a mountain horseback hunting for mule deer about three years ago. He has been instrumental in planning and providing for the hunts. Our original purpose in putting these types of hunts together was to show some appreciation to these who have sacrificed so much for all of us. We hope to show appreciation and here in the mountains, let them reconnect with the Good Lord, Jesus. One of the men made the comment as he was leaving, I thought I was going on an elk hunt, I did not realize it would be a life-changing experience. It is our hope that this was a life-changing experience for them. I know it was for me and everyone else who participated in support. These soldiers, true wounded warriors, are men who are true American Heroes. It was those of us who provided logistical support to them this past week who may have received the most Blessing. We were disappointed in the lack of elk harvest. But each of these men made it very clear that this was the trip of a lifetime. We often wonder how the current difficulty that we are going through is in agreement with the above statement, “… plans for good and not for disaster.” I watched these young men camp above 10,000 feet elevation. They pushed their own wheel chair. They struggled with dragging a prosthetic over snow and deep grass. They were physically exhausted from the strain of walking and moving on legs with no feeling. They had pain and discomfort from metal rods in their back to the point they could not stand. Yet, they never once complained. They simply smiled, laughed, and enjoined the journey. And, as the week wore on, they seemed to get more life in them. They had more energy. They had more vitality. There is no question that they all have physical obstacles to overcome. There is also no doubt that they have embraced the message from Jeremiah that in spite of this difficulty that was not caused by God, they know they have a future and a hope. Let me challenge you to enjoy the struggle. I know often in my life I did not enjoy the struggle enough. We are not all called to be warriors. Some are called to be administrators. Some are called to be logistical support to ministry and mission. Some are called to be leaders. Whatever your calling may be, let me encourage you to enjoy the struggle. It is not about reaching the prize. It is not about harvesting an elk. It is about the hunt.